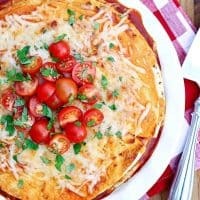 My family loves quesadillas, and they love enchiladas, so combining them in one tasty Tex-Mex dish only seemed natural. What’s not to love about a big stack of cheesy quesadillas, covered in enchilada sauce? And that’s how Quesadilla Enchiladas were born! 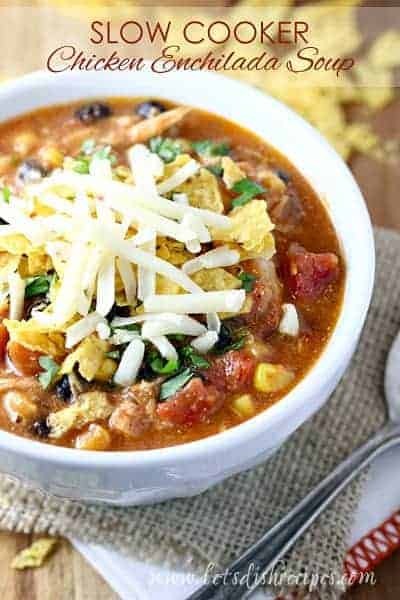 And there are so many ways you could adapt this recipe! Try using green enchilada sauce instead of red, or add some chicken, beef or beans to your quesadillas. This meal is so easy and comes together so quickly, but if you’re really in a hurry, you could skip toasting the quesadillas in the skillet first. But it adds great flavor and texture, so I think it’s really worth the extra few minutes. 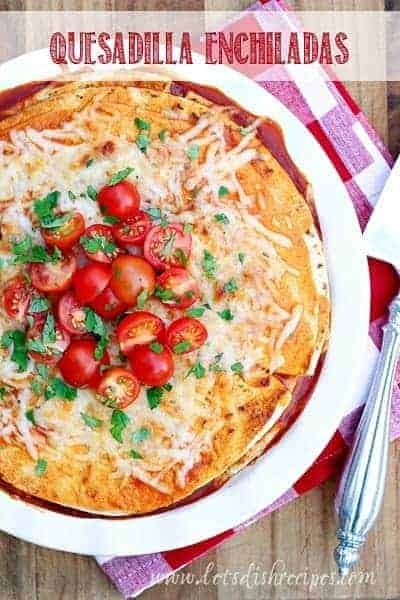 We like to top these Quesadilla Enchiladas with our favorite taco toppings, like fresh tomatoes, guacamole, cilantro and sour cream. 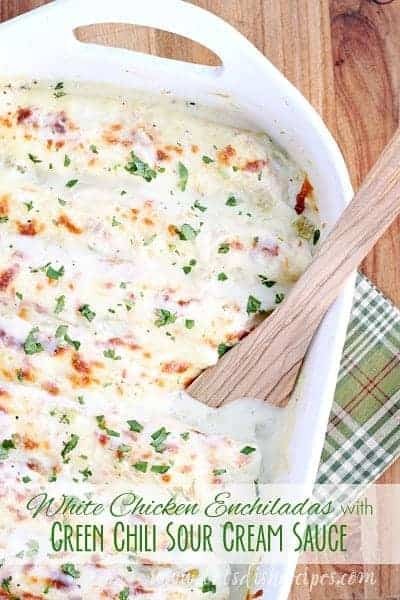 This is a favorite family recipe that’s always a hit! Cheese filled tortillas are stacked with cheese and enchilada sauce in this crowd-pleasing Tex-Mex style dish. Preheat oven to 375 degrees. Spread a few tablespoons of enchilada sauce in bottom of lightly greased, 9-inch pie plate. Heat oil in a nonstick skillet over medium-high heat. 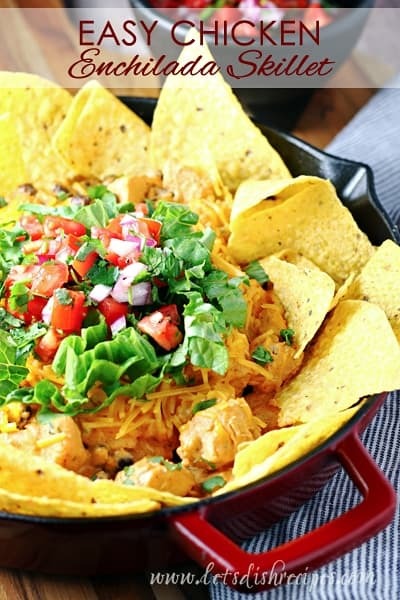 Toss cheeses together in a medium bowl. Place about 1/4 cup of cheese mixture onto half of a tortilla. Fold the tortillas over to create half moons. Repeat with remaining tortillas times. You should have a bit of extra cheese. Layer two quesadillas in the pie plate, overlapping a bit if needed. Spread about 3 tablespoons of enchilada sauce over the quesadillas. Repeat until you have used all of the quesadillas. Spoon remaining enchilada sauce over the top of the quesadilla stack and sprinkle with remaining cheese. Place the pie plate on a cookie sheet to catch any drips. Bake for about 20 minutes or until edges begin to brown and the sauce and cheese are bubbling. Let stand 5 minutes before slicing into wedges to serve. Top with favorite taco toppings, if desired.